Splash around in the Children’s Pool with Whale Fountain. Dive in from the high board or slide down the water slide to enjoy the cool, refreshing water. Youngsters in need of shallower water can play in the kids’ section with bubbling whale fountain. Parents can relax in the sun with the lounge chair while keeping a watchful eye on their kids. After playtime has ended, rinse off under the functioning shower before heading back to the tent. Set includes four figures, a pair of arm floaties, beach bag, sunglasses, sunscreen, cooler, water bottle, and additional accessories. Last known price is 28% above the initial Playmobil retail price! 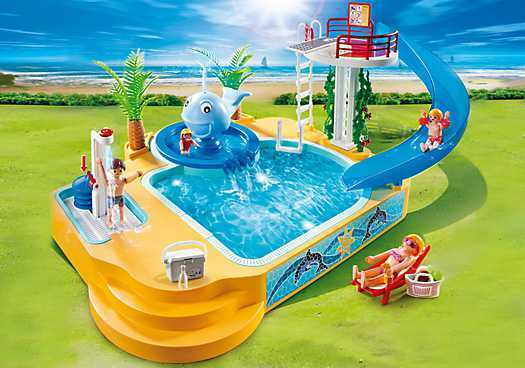 The Children`s Pool with Whale Fountain (5433) Playmobil set is no longer directly available from the sites below. However, 3rd party partners of these sites might still have the set available.